The passionfruit vine is a shallow-rooted, woody, perennial, climbing by means of tendrils. The alternate, evergreen leaves, deeply 3-lobed when mature, are finely toothed, 3 to 8 in (7.5-20 cm) long, deep-green and glossy above, paler and dull beneath, and, like the young stems and tendrils, tinged with red or purple, especially in the yellow form. A single, fragrant flower, 2 to 3 in (5-7.5 cm) wide, is borne at each node on the new growth. The bloom, clasped by 3 large, green, leaflike bracts, consists of 5 greenish-white sepals, 5 white petals, a fringelike corona of straight, white-tipped rays, rich purple at the base, also 5 stamens with large anthers, the ovary, and triple-branched style forming a prominent central structure. Within is a cavity more or less filled with an aromatic mass of double-walled, membranous sacs filled with orange-colored, pulpy juice and as many as 250 small, hard, dark-brown or black, pitted seeds. The flavor is appealing, musky, guava-like, subacid to acid. There is currently a revival of interest in the pharmaceutical industry, especially in Europe, in the use of the glycoside, passiflorine, especially from P. incarnata L., as a sedative or tranquilizer. Italian chemists have extracted passiflorine from the air-dried leaves of P. edulis. 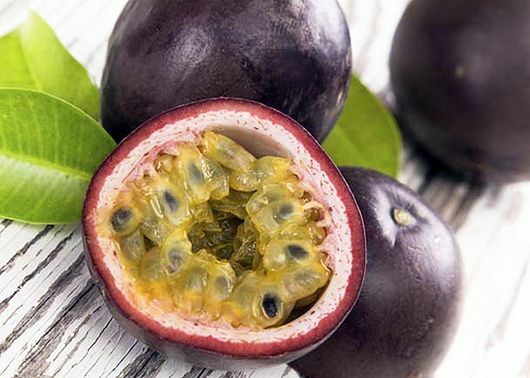 in other countries, The juice of passionfruits is given as a digestive stimulant and treatment for gastric cancer.